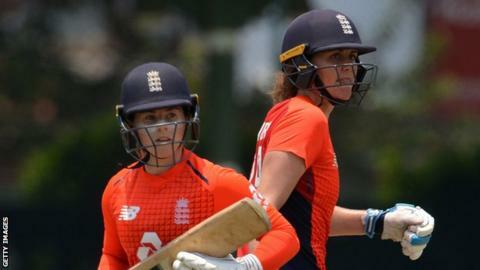 England's women made their second highest Twenty20 international score as they thrashed Sri Lanka by 96 runs to complete a 3-0 series whitewash. Danni Wyatt made 51 and fellow opener Amy Jones 57, while Natalie Sciver hit 49 not out and Tammy Beaumont an unbeaten 42 in the tourists' 204-2. Sri Lanka made only 108-6 in reply as Kate Cross took 2-20. Victory was England's 10th in succession on their tour of India and Sri Lanka. England won the final match in a 2-1 one-day series defeat in India, but won the T20 series 3-0 before beating Sri Lanka 3-0 in the one-day series that preceded the T20s. England's highest T20 total is the 250-3 they made against South Africa at Taunton last year. Despite losing the toss for the sixth game running, England finally got their wish to bat first and put on a devastating display on their way to the highest T20 total in Sri Lanka. Danni Wyatt and Amy Jones' stand of 96 in their second game opening the batting together suggested there is much to come from this pair. Boundaries were struck all around the ground, mighty shots were launched over the ropes and Sri Lanka's beleaguered bowling attack looked defeated. That England have won this series is of little surprise, but the fact they have won 10 on the bounce in the subcontinent suggests a ruthlessness and determination that should be applauded. While Mark Robinson's charges head toward an Ashes summer with a bundle of momentum, for Sri Lanka this was a reminder of what work there is to do before they can think about challenging the world's best sides.